We’re ready for a cross-country voyage to Boston for the 36th Annual Boston International Antiquarian Book Fair this weekend! Boston is a city steeped in literary tradition, and it was the first city in the New World to emerge as an enclave of authors and publishers. It’s no wonder that Charles Dickens chose it as an important destination when he came to America in 1842 and again in 1867. 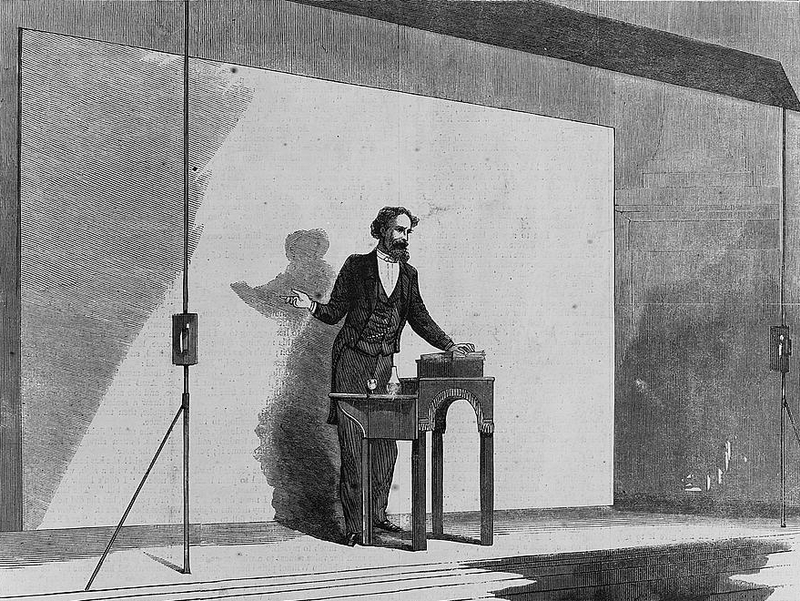 The confluence of advancements in steam and rail travel, along with new photography technology, contributed to elevating Dickens to celebrity status. The Inimitable was indeed the one of the first in the nineteenth century to achieve such a vaunted position. Proclaimed the “first American edition” of Dickens’ ‘American Notes,’ this Brother Jonathan edition actually missed that distinction by mere hours. On January 3, 1842, Charles Dickens boarded the steamship Britannia and started his first voyage to America. Though he wasn’t yet even thirty years old, Dickens had already attained incredible popularity on both sides of the Atlantic. He planned to take a year off from writing and explore the United States. Dickens, his wife, Kate, and maid Anne Brown faced unusually rough seas on their journey but arrived in Boston relatively unscathed on January 22, 1842. Dickens stayed in Boston a whole month and fell in love with the city. “Boston,” he said, “is what I would like the whole United States to be.” Dickens had a relatively ambitious travel agenda; he planned to start in Boston, then head west and explore the country. He also had another ambitious goal: to introduce the idea of an international copyright law. Dickens’ works were regularly pirated in America, costing Dickens untold sums each year. He reasoned that American authors–whose works were frequently pirated in Europe–would also benefit from international copyright law and would support the idea. But such would not be the case. Dickens broached the subject at a “Young Men of Boston” dinner on February 1, 1842. He met resistance from both his fellow authors and the popular press. It would be another fifty years until an international copyright law was implemented. Dickens would, however, eventually manage to forge a relationship with American publisher James T Fields, who held absolute volume rights to Dickens’ novels in America. Not that this mattered to some US publishers, but nevertheless, this provision offered Dickens some modest remuneration for his popularity in the States. Dickens’ impressions would be published in American Notes, which Dickens completed in only four months. The work painted an unflattering picture of America: Dickens attacks slavery and descries Americans’ general lack of social awareness. He blamed the latter on the press. Dickens further explored the shortcomings of the new republic in Martin Chuzzlewit, when young Martin goes to America. Dickens’ scathing representation of the country temporarily crushed his popularity, but he soon recovered. A banquet with “upwards of one hundred celebrities” was held in Dickens’ honor before he departed London in 1867. This pamphlet records speeches made by Dickens, Lytton, Russell, Trollope, and others. In 1867, Dickens finally succumbed to the temptation of another lucrative book tour (and who can blame him, what with so many mouths to feed at home?). By this time, the Civil War had resulted in the abolition of slavery, and Dickens found America much changed. On April 18, 1868 at a dinner in his honor, Dickens alluded to his previous negative impressions of the country and admitted that both he and the United States had evolved. He promised to make appendices to both Martin Chuzzlewitt and American Notes to mitigate his prior views. That dinner was one of seemingly countless appearances and events that Dickens attended during his second trip to America. He’d considered bringing his mistress, Ellen Ternan, with him for the tour. But tour manager George Dolby, who’d arrived in Boston early, learned that bringing Ternan would be a serious faux pas. Dickens would travel, then, only with his staff. By this time his health was failing; he’d spent many previous weeks unable to walk without assistance. But he’d been guaranteed £10,000 from a consortium of Boston dignitaries, with his publisher Fields leading the initiative. Boston had little else to occupy itself during Dickens’ visit; the lack of crisis or election left them plenty of time to indulge in Dickens mania. Dickens did his best to avoid the throngs of adoring fans, passing his down time in his rooms at the Parker House. He still managed to meet members of Boston’s intelligentsia, such as illustrators Sol Entinge, Jr and Thomas Nast, scholar Charles Eliot Norton, and science writer Louis Aggasiz. This first US edition of ‘A Christmas Carol’ is, in our experience, offered much less frequently than the first UK edition. Dickens pushed himself through a grueling schedule of readings and other events during this visit. He found that ticket scalpers had become terribly aggressive; for example, when Dickens read at Harvard on December 2, 1867, not a single student was able to obtain a ticket. That day, Dickens read from A Christmas Carol, much to the pleasure of his adoring audience. On November 30, 1868, the Saturday Club met at the Parker House to hear Dickens read. The author was noted for his elaborate dress and stage set-up, and this event was no exception. In front of a massive maroon backdrop, and atop a maroon carpet, sat a custom designed reading desk. The desk held a variety of gas pipes designed to provide proper lighting for different moments in the reading. Dickens delivered a 2.5-hour program with only a ten-minute intermission. Dickens was himself a member of the Saturday Club, which also included colleagues like Oliver Wendell Holmes and Henry Wadsworth Longfellow. Though Dickens generally dined with Fields at the Parker House, he joined Longfellow for a traditional Thanksgiving meal. The meal was surely a sober affair. Longfellow had recently been made a widower. His second wife, Frances Appleton, had been immolated in an accidental fire. Longfellow wore a beard to cover the disfiguring scars he’d incurred trying to save her. Then in New York from December 25, 1867 to January 4, 1868, Dickens enjoyed a traditional Christmas holiday with Fields. Afterward he continued to push himself past his own limits–both professionally and personally. On February 29, 1868, Dickens participated in what he jokingly called the “Great International Walking Match,” a competition more suitable for a man used to walking up to twelve miles a day, rather than a man of Dickens’ careworn constitution. The weather that day was terrible, but Dickens and his friendly competitors persisted. In a letter to his daughter, Dickens called himself the “Gads Hill Gasper” and said, “As the subtitle of the famous broadside said, ‘the origin of this highly exciting and important event cannot be better state than in the articles of agreement subscribed by the parties.” Following this athletic exertion, Dickens required a full rubdown before he could attend dinner–and he fell into his own bathtub, fully clothed, later that same evening. Dickens would depart from Boston on April 10, 1868. He quietly traveled to Westminster, New York, where he stayed until sailing back to England on April 22, 1868. Thanks to the adulation of Dickens’ American readers, the author became one of the first modern celebrities. This entry was posted in 19th-Century Literature, Charles Dickens, Events and tagged A Christmas Carol, American Notes, Boston Book Fair, Charles Dickens, Martin Chuzzlewit on November 13, 2013 by tavistock_books.